Scottish crest badges are heraldic devices used worldwide by Scottish clan organizations The official badges are those approved by the Standing Council of Scottish Chiefs. Clan Sinclair has one of these official badges. There are numerous badges that do not have official standing because the lineage of descendents has been lost over the years and there is no recognized "chief". The Clan Stewart badge is one of these. A badge with a buckle at the bottom signifies allegiance to the clan chief. The chief's badge doesn't have a buckle at the bottom. It is a complete circle with three eagle feathers at the top. 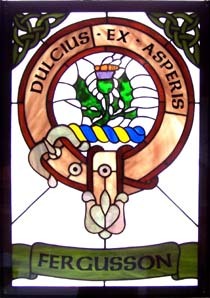 I am a member of Clan MacBean and have done our clan badge in stained glass five times, including the clan chief's badge for the front door of his home. My wife is a member of Clan MacKenzie and I have done her clan badge as well as the badges of many other clans. My next project is a Clan MacLachlan badge. These artworks are all copper foil construction. I do more foil than lead because I can keep the lines delicate and get more detail I've been told that my designs have way too much detail but you have to do what you see. I have been using Glass Eye 2000 for about three years and it has made a wonderful difference in my work and my ability to create a pattern that I'm happy with. I have used it to draw all of my clan badge patterns except for the first two. The badges have the same format: a circular belt with a buckle at the bottom, an inscription or motto around the belt and a heraldic device in the center of the belt. The difference is the motto and the heraldry. I used Glass Eye 2000 to draw the basic belt design and saved it as a template. When I want to create a new badge design, I scan in an image of the badge and use the software's drawing tools to trace the heraldry. I then fine-tune the design to make it as close as possible to the original and yet still be able to cut the pieces. Sometimes this requires painting on glass or fusing to avoid excessive lead lines. One of the badges I've done in glass was Clan Fergusson. The heraldry is a bee sitting on a Scotch thistle. All the thistle leaves end in spines or points. If I ever do this one again, I will cut the leaves and fuse them to the base glass to reduce the number of lines! 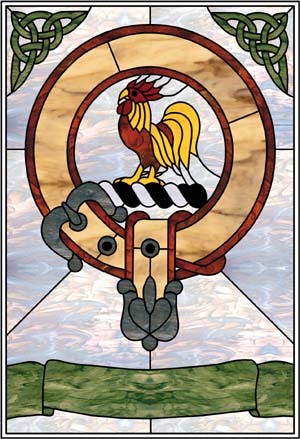 The lettering in the motto and the clan name are sandblasted into the glass and painted with glass paint before the mask is removed. I used to use flashed glass for the belt and scroll but it got way too expensive and this way the paint shows up better. 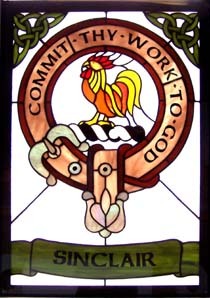 The Clan Sinclair badge is installed in one of a pair of front doors for a home near me. The other door holds the Clan Fergusson badge that I mentioned. My customer is a member of Clan Fergusson and his girlfriend of 17 years is a member of Clan Sinclair. He commissioned the door panels as a surprise for her for their new home. I installed the panels one afternoon while she was away so when she got home she had two new front doors. "Surprised" would be putting it mildly! She loves them, which is always the best part of a commission. I have used a number of other drawing programs over the years including Harvard Graphics, CorelDRAW, CAD programs, Adobe Photoshop and Adobe Illustrator. I have the Professional Plus Edition of Glass Eye 2000 and it is by far the best tool I have ever used. It gives me the ability to adjust line positions without having to worry about lines maintaining their connections. I love it. The "Glass" tab on the Color Selector is particularly useful and fun to work with. I can color pieces and get a good idea of what the glass will look like. I can try different colors and textures of glass with a few clicks of the mouse. I have also added photographs of my own iridescent glasses to the glass library. Ray is a disabled Vietnam era veteran of Scots-Irish heritage who has a bachelor's degree in biology. He spent 25 years in the food processing industry as a food microbiologist, quality assurance supervisor and quality assurance manager. In 1981 he started working with stained glass as a hobby, and then the following year opened a studio in southern California called Northern Lights Stained Glass. He later moved to northern California and started Pegasus Art Glass. Ray enjoys his stained glass business but still finds time to take care of ten acres, five horses and the usual ranch menagerie of dogs, cats and chickens. You are welcome to send Ray an email.